It took me more than 6 month to find out this Cool Draggable-Resize-Bar (currently at the right hand side) does exist. Or is it newly established? Anyway, I feel that function might be used by even more users if you placed it at the left-hand-side instead of the right hand side. The left hand-side-position would allow you to add a tiny hint layered above the black bar next to it. Thus you could help the users to actually find this function, and to encourage the users to actually use this option. It is cool to be able to change the width of the screen this way. 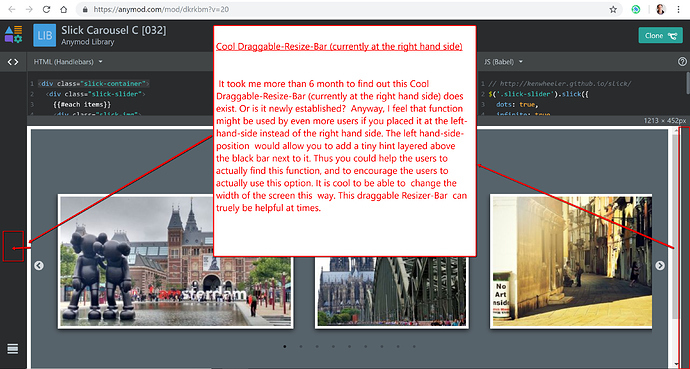 This draggable Resizer-Bar can truely be helpful at times.